Here's the bald truth: I've never been to American Christian Fiction Writer's annual conference. So why should you listen to me on the subject of what to pack? I'm greener than a bar of Irish Spring Soap. Well, my inexperience is precisely why I've been doing research as I plan what to pack for this year's ACFW Conference in Indianapolis (starting in a matter of days!!). I've read others' blogs on what to take, asked questions of the other Inkies, and learned from my experience attending RWA 2012. I thought I'd share what I learned with you. 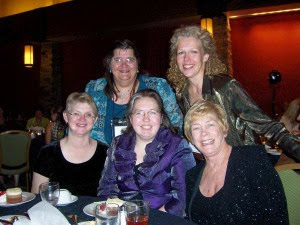 RWA12 with Debby Giutsi, Anne Barton, Sandra Leesmith, Anita Mae Draper, and me, in need of a haircut. Clothes, of course. Here's a riddle for you: What's black and white and red all over? At RWA 2012, the answer was Me. I coordinated my clothes like a Garanimal; that way, everything matched so I could take fewer shoes, I wouldn't have to change my entire outfit if I spilled on something, etc. Conference wear is Business Casual. To some, this means denim; to others, it means suit. You want to be comfortable but neat, and remember that it's better to be overdressed than under-dressed. I take my favorite jeans for "off-campus" trips, but at the conference, I dress churchy. Less than you think you need, according to Gina Welborn. In other words, pack light. Take layers. Barbara Early reminded me that "rooms are either too hot or cold." Debra E. Marvin agreed, sharing, "The one time I went to a conference in downtown Indy, I packed for warmer weather and they had a cold spell. I was freezing in the hotel as well. Walked next door to the mall and bought something warmer to wear." I did the same thing at RWA: I was so cold I ended up buying a shawl in the hotel gift shop. I was not the only one wrapped in a shawl during workshops. Cozy clothes for down time, like hanging out with friends, suggests Gina Welborn. Something fancy for the gala Sunday night (church-appropriate to formal, according to the website). Flat Shoes.Unless you're the type of person who is fine wearing heels all day long, bring along some nice, comfy flats. You'll be on your feet a lot. Sufficient Electrical "Stuff": Lisa Karon Richardson suggests if you bring a laptop, you "may want an extension cord as well. The classrooms can be pretty large, and if they run out of juice they may be too distracted to pay attention to the workshop." Same goes with supplies for your hotel room. Anita Mae Draper brings "a power bar for laptop, tablets, chargers, etc. There are very few open plug-ins because most are filled with cords from tv, lamps, radio, microwave, coffeepot, etc." Anita Mae Draper also brings a handheld luggage scale "for weighing suitcases before leaving the hotel. I first saw one used by Gina Welborn and now I never travel without one. Provides peace of mind at a hectic time." Airlines don't like it if your suitcase is over 50 pounds, and the resulting fees are not part of my budget, so I will be hitting up my roomie Anita to borrow her scale. Hyatt Regency, Indianapolis. by Frankie Roberto, via WikiCommons. Stuff you will need if your luggage gets lost. Remember to take medicines, a change of clothes, etc in your carry-on. Suzie Johnson always brings essentials, including a "needle and thread in case Amrak sends your luggage to Canada, and the only clothes you can find with the money Amtrak gives you to shop with, fit everywhere but the waistband, so you have to take a tuck or two - or forever be tugging at your pants. Seriously, it's happened to me twice." First-Aid--Suzie Johnson brings band-aids. They take up almost no room and I tend to get hangnails, so I tuck a few into my bag, too. Food. More than one Inky suggested this since sometimes, hotel food can be a) expensive or b) unappetizing. Suzie Johnson also brings "tea bags. Always tea bags." Whatever helps you sleep. 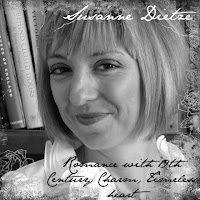 Debra E. Marvin suggests "chamomile tea, Nitey Night, ear plugs, or a mask. Also, bring makeup to cover the dark circles because you are going to be in about 50 photos in cyberspace." What to take in your tote bag/big purse? You'll no doubt carry a bag around with you when you travel, attend workshops, etc. Snacks are always smart. Barbara Early likes to take "chocolate--small pieces in quiet wrappers, for that afternoon slump. And a few ginger teabags if you get a nervous stomach." Before a pitch appointment, perhaps? I can relate to that. Also, I always have a snack bar in my bag, because if I go too long without protein, I become fatigued and grumpy. If you meet me at conference, bear in mind I may want to include food in our chit-chat! Business cards and any other printed promotional items. Remember your business cards advertise your industry, which is YOU. Your card should include important info, such as your name, tagline, and website information. Mine also includes a photo of me, my twitter ID, and my agent's contact info. If you do not have an agent, be sure to include your email address. An Organizer of some sort. Gina Welborn shares, "Gina Conroy did a blog post about creating a binder with conference schedule, bios of agents and editors in attendance, any other info you can find on the agents/editors to refresh your mind about that person before you meet, plastic pages for businesses cards you receive, and copies of one-sheets, etc. Oh, I also created a list of Conference Goals. That notebook was my Go To booklet." One-sheets for pitch appointments. I use Vistaprint to print my one-sheets of my proposals for my editor pitches, but you can print something up on your computer easy-peasy. Prepare a one-sheet cheat-sheet for pitches, but memorize your elevator pitch. Also think about who your audience is, why you think you might be a good fit for a publishing company, and any other pertinent details about your story. Unscented sanitizer, lotion, etc--unscented is a rule at ACFW. I do not know if there are allergy police sniffing for hairspray, but the bottom line is, be conscientious and try to stay fragrance-free. $1 bills to tip with. There are a lot of people to tip: maids, airport shuttle drivers, cabbies, etc. Medication, even if it's something you might not need like allergy meds. Barbara Early says, "Better to pack it and not need it than need it and not pack it." Credit Card. You'll have plenty of opportunity to use it eating, buying books, etc etc etc: in other words, expect to spend some $$$. Your Bible, but I suggest downloading a free e-version rather than taking your favorite translation. You'll have lots of books to bring home, adding additional weight to your luggage. Arranged plans: Gina Welborn suggests you "make a list of authors you want to connect with, and pre-schedule as much as possible times for you to meet. I have some authors I'm doing that with." Stay hydrated. You can bring a water bottle, but at RWA, there was water provided at most of the workshops I attended. Try to get some rest, too. At conference, there's always something going on. You have to say no to something. That's ok. Enjoy what you experience! At least, that's one of my goals. How about you? Do you have any tips for me as I pack? Susanne Dietze is a Genesis finalist this year, and will therefore be so nervous she'll have a hard time eating her Gala dinner Sunday night. Considering she wrote this post, however, she will remember her own advice to eat something. I'm glad I'm not the only one who needed a shawl--at RWA I thought covetously (for the first time) of a Snuggie. Some of the conference rooms were freezing! Good thoughts from everyone, Susie. I would add a sense of humor. Because something will inevitably go wrong. Life will be smoother if you can laugh about it and make space for God to act in unexpected ways. I know what you mean, Suzie! I am not the best "light" packer. Very nice post, Susie! My outlook on packing is much more relaxed than it used to be. One thing I learned for myself: I want to represent myself in a businesslike, put-together way, but I also need to be myself and feel comfortable. That means you're going to find me in jeans part of the time. Nice, dressed up jeans, but yes, jeans. And comfy shoes. Be yourself: great advice, Jen. I am so late to this post. I think I was in crazyland the day this posted. Cleaning house for my renters or sewing grommets on someone's stays? who knows??? well, I'm off to choose my incredibly amazing wardrobe for the conference. I went to the second hand store and into the attic. Am I scaring you? besides it's all about the costumes this year anyway... who are we kidding. My friend Lyndee is bringing a civil war dress. yikes. that's a lot to pack!